An awning on your vehicle provides outdoor living space as well as shelter from rain and sun. The new Rhino-Rack Compact Batwing Awning maximizes that outdoor living space on your small or midsize adventuremobile. 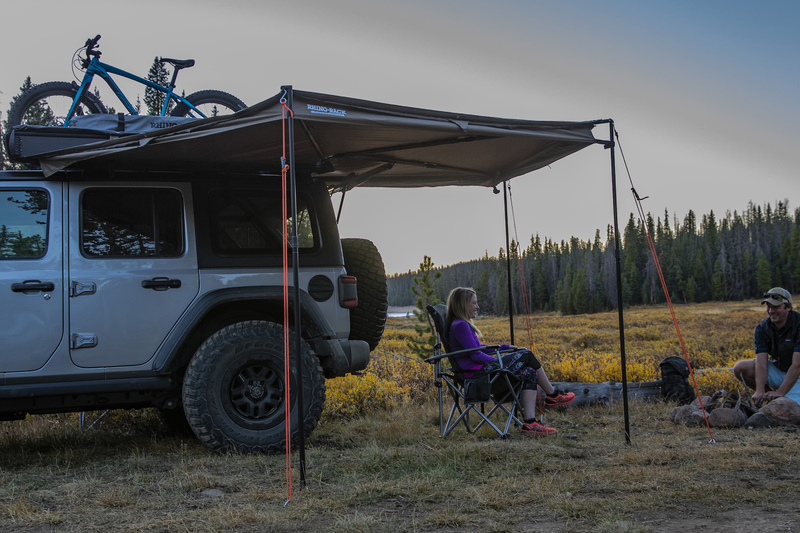 With 270 degrees of shade and 68.9 square feet of coverage, the Rhino-Rack Batwing Compact Awning is a perfect fit for most small and midsize adventure vehicles. Think Jeep Wrangler, Toyota 4Runner, Ford Escape, Subaru Outback, and the like. It just hit the market and will run you $649. There are a handful of wraparound awning systems on the market. Most are quite large, heavy, and expensive. They tend to work well for full-size trucks, vans, and bigger expedition vehicles but are a bit bulky for smaller vehicles. The popular original Rhino-Rack Batwing is one such awning. 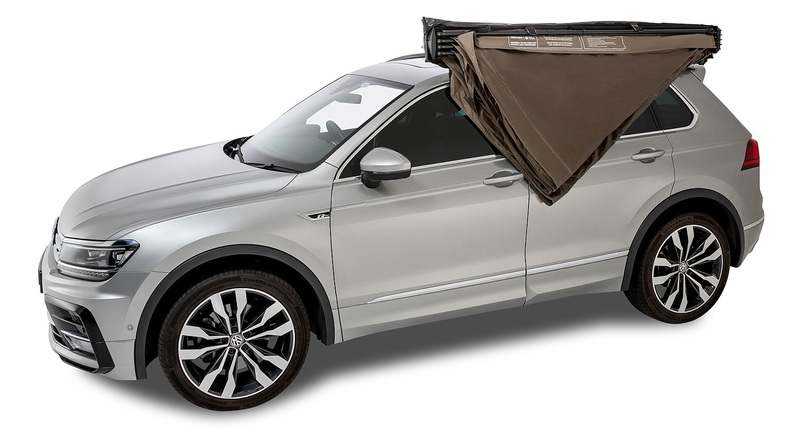 It retails for $699, weighs 47 pounds, and offers a massive 118 square feet of shade. When packed away, it’s a full 9 feet long. The new Rhino-Rack Batwing Compact Awning is specifically designed for smaller vehicles. It weighs in at 40 pounds and is 6 feet 6 inches long when packed away in its storage cover. The awning is rated to UPF 50, water- and mold-resistant, and designed to be durable. It’s rapidly deployable by one person. Lightweight, powder-coated aluminum legs unclick from their storage position and easily drop into place. Holes at the bottom of the legs and included guy rope ensure the awning is rock steady when the winds pick up. The black UV-resistant awning cover keeps the dirt and sun off the awning when it’s packed away. There is an integrated pocket in the bag to hold all the stakes and guy ropes. This ensures you don’t lose anything and don’t have to find storage elsewhere in your vehicle. You can get brackets to mount the awning on either side of your vehicle. While not inexpensive, the new Rhino-Rack Compact Batwing Awning should be a great addition to your personal adventuremobile. 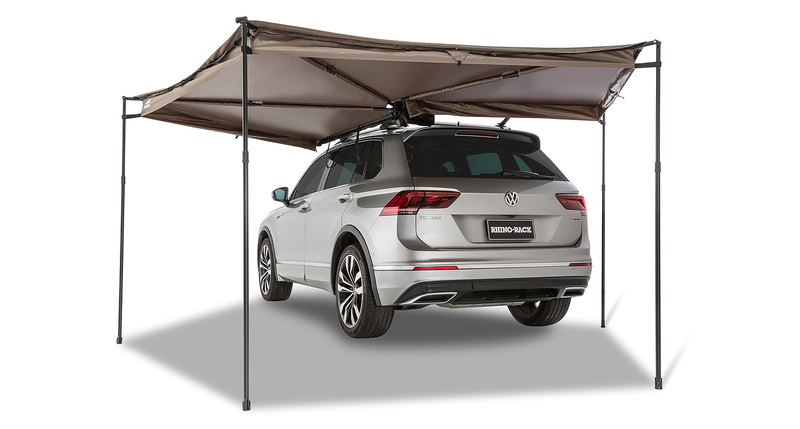 A wraparound awning is a quality adventure accessory for your vehicle, providing a shaded area for roadside lunch on long road trips or a camp kitchen spot out of the rain on car-camping adventures. 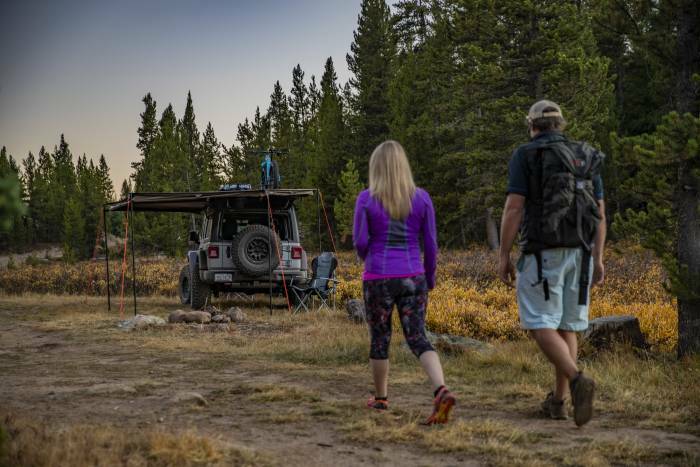 From trucks and cars to campers and RVs, we cover vehicles used for outdoor adventure. VW Atlas Basecamp Concept: The Ultimate Mountain Bike Adventure Rig? next:Easiest Route to Fame: Is Polar Exploration Becoming a Speed Play?